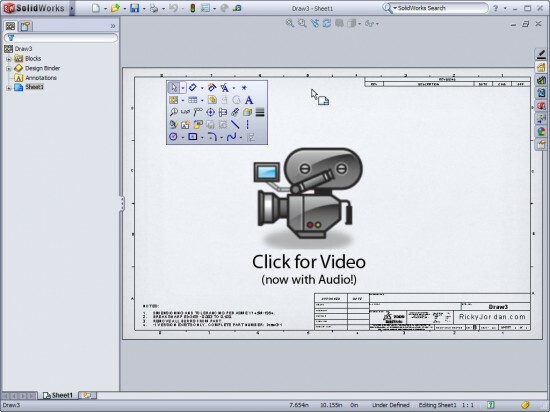 The S Key Experiment continues for me and in this post we dive into Part 3 which covers using the S Key shortcut menu in the Drawing environment of SolidWorks 2009. In case you missed it, I covered the Part Environment in Part 1 and the Assembly Environment in Part 2. I have found the S Key to be a GREAT tool in SolidWorks and I have not turned the CommandManager OR my Toolbars on since the experiment began. Click on the image below to view the video. are these done at midnight when nothing is stirrring not even the mice? a special Xmas message? a word from our sponsor? Yes I discovered the S key a while ago, and have customised it for all three file types. It's allowed me to turn off all toolbars, and have a nice big clean work space. Yes….the videos are most of the time made late in the evening. Believe me…if my kids were up…you would hear them in the videos! I agree Adam. I've really grown accustomed to having no Toolbars or CommandManager now. I think it is here to stay for me! Thanks Gale! I've had a surprising number of users telling me that they are trying it for themselves after viewing the videos. hmmm strange cos its quite low vol for me..
since no one else has mentioned it iI guess it must be my issue here(?).. Excellent demos on the use of the S key. I don't know where I have been but I will be teaching this trick to students. Thanks for showing the results of your experiment. you would hear them in the videos!